Directions (1 – 5): Below is given a pair of pie chart and bar graph representing number of students in different classes in a school in 2015 and growth in 2016. Based on this information, answer the questions that follow. 2. If the increment in all the classes has only been in the form of girl students, then what will be the ratio of total number of boys and girls in 2016? 3. 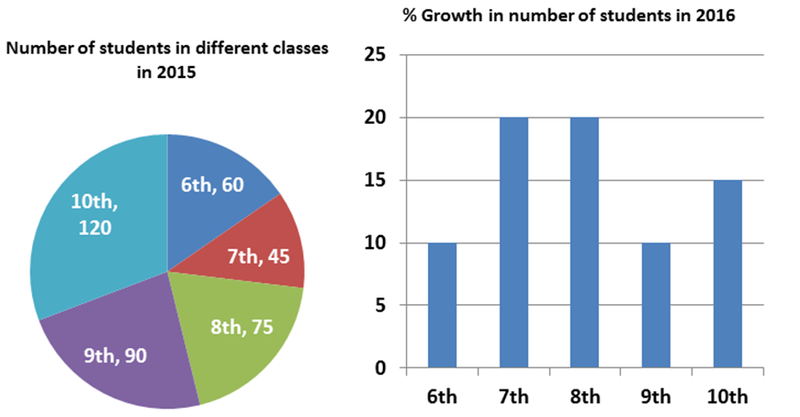 Instead of 20%, what should be the minimum growth in number of students for class 7th, so that it does not have minimum number of students in 2016? 4. What will be the average number of students in classes 8th and 9th taken together in 2015 and 2016? 5. What should be growth in number of students for class 8th in 2017 so that their number becomes same as number of students in class 9th in 2016? 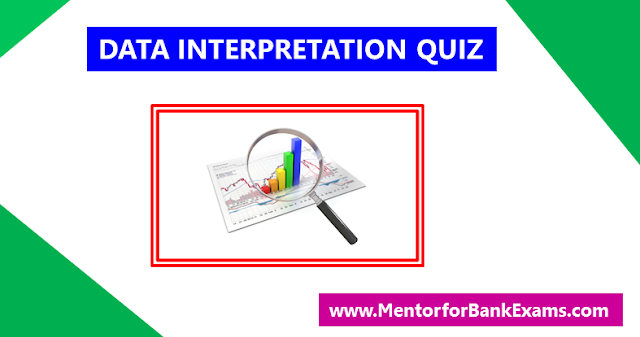 Directions (6 – 10): Study the table carefully and answer the following question. The given table represents 10th and 12th class students reading different subject in a school. 6. What reading the difference between the number of 10th class students reading English subject and the number of 12th class students reading Math? 7. Which subject has the maximum number of 10th class students reading? 8. The 10th class students reading Hindi subject are how much percent more than 12th class students reading Hindi subject? 9. What is the approximate average number of 12th class students reading subjects in English language? 10. What is the difference between the number of 12th students reading computer and the number of 10th students reading economics? Directions (11 – 15): Study the following graphs carefully and answer the questions that follow. 11. If the total income of Company A in all the years together was equal to the total expenditure of Company B in all the years together, which was Rs. 265 lakhs, what was the total percentage profit earned by Company A for all the years together? 12. 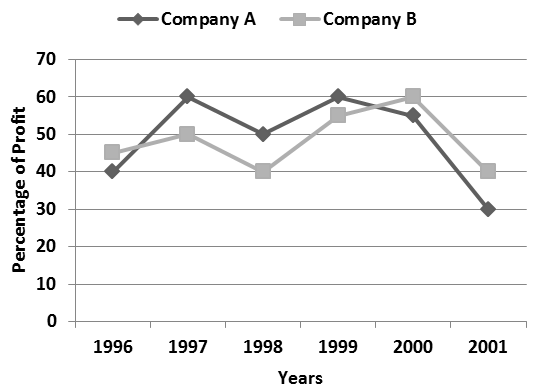 If the income of Company A in 1999 was equal to the expenditure of Company B in 2001, then what was the ratio of expenditure of Company A in 1999 to the income of Company B in 2001? 13. If the total expenditure of the two Companies in 2000 was Rs. 18 lakhs and expenditure of Companies A & B in that year were in the ratio of 4: 5 respectively, then what was the income of Company B in that year (in lakh)? 14. If the income of Company B in 1999 was Rs. 18.6 lakhs and ratio of incomes of Companies A % B in 1999 was 4: 3, What was the expenditure of company A in 1999 (in Rs. lakh)? 15. If the income of Company A in 1998 was equal to its expenditure in 2000, what was the ratio between Company’s expenditure in the years 1998 and 2000 respectively? 2. E) We do not have the original distribution of boys and girls in 2015. So, actual ratio cannot be determined neither for 2015 and nor for 2016 after increment. ∴ Ratio cannot be uniquely determined. 3. C) To not have the minimum value, number of students for class 7th should be more than 66. 5. A) Suppose growth is T% for class 8th students in 2017. ∴ Growth should be 10%. Since, the 10th class students are reading in maximum for Physics. Therefore this subject has the maximum percentage of 10th class students. 11. D) The answer can’t be determined. Because we need more data to solve this type of question. We don’t have the Expenditure of all over the year for company A that is essential to solve this question.